✔ EASY FLIP & FOLD TECHNIQUE – Innovative quarter folding design. The table folds down to an ultra portable size and when unfolded opens to 25.6" x 19.7". The outdoor table has adjustable telescoping legs and can support weight up to 66 lbs. 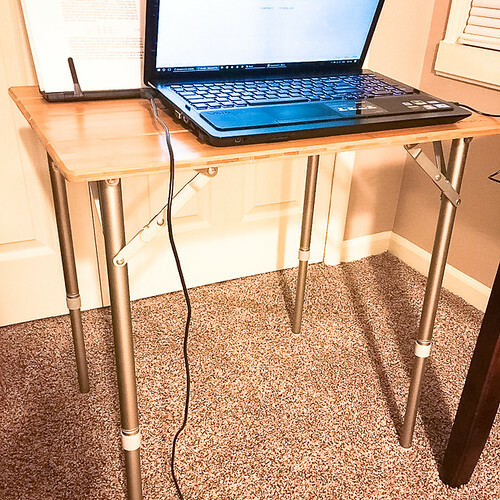 ✔ TWIST AND ADJUST – The standard SmartFlip portable table is adjustable at ANY height between 25.6" (waist high) and 17" (knee high). Other tables offer only one height. The legs can be adjusted by simply twisting, extending, then locking the legs. ✔ INCLUDES CARGO STORAGE ACCESSORY NET – A great and easy way to add storage and organization. It has 4 hook latches for quick installation and takedown. Simply hook each latch onto the leg of the folding table and you are good to go. Store tools, utensils, gadgets, toys, lights & lamps, food, fruits, and more. When not in use, just fold and store in its own carry sack. ✔ PREMIUM MOSO BAMBOO – This particular species of bamboo is the most common species used in the bamboo textile industry. Its physical properties boast an average breaking tenacity more than three times that of cotton, wool, rayon, or polyester. This tabletop is made of moso bamboo, it’s light but can support up to 88 lbs or 66 kgs on the table top. The upgraded carrying case is made with improved polyester and features a shoulder strap (standard case does not offer this). The cargo storage net is made from durable lightweight polyester. ✔ SUITS OUTDOOR AND INDOOR ACTIVITIES – The foldable table is suitable for picnics, beaches, fishing, camping, parties, hiking, outdoor concerts, and more. Perfect for outdoors, but also great for indoor use. Are you looking for a portable table that you can use both indoors & outdoors – something that you can drag to the porch while you work on some papers or bring to the park when you go on a picnic with your family? Don’t look far. Beckworth & Co.’s SmartFlip Bamboo Portable Folding Table is your best choice! ✔ IS EASY TO SETUP, USE & CARRY – It features a 1-piece design so you can easily set it up without installing any table parts. It folds and unfolds in under a minute! The foldable table unfolds to 25.6" x 19.7" and folds to a compact, portable and easy-carry size. Carrying case has shoulder strap for comfortable and convenient transport. ✔ ADJUSTS TO VARIOUS HEIGHTS WITH STEADY SUPPORT – The telescoping legs can be adjusted at ANY height between 25.6” and 17”. Just twist, extend to your preferred height, and then lock the legs. The portable table can hold weight up to 66 lbs. ✔ HAS CARGO STORAGE NET WITH CARRY SACK – The cargo storage mesh bag is an innovative way to store and organize your things like bbq tools, camping gears, umbrellas, gadgets, snacks, veggies, and other items. It is easy to install, and expands your storage when you have limited space. It has 4 hook latches. Just hook each latch onto the leg of the outdoor table and it’s done. ✔ IS MADE OF QUALITY MATERIALS – Tabletop is made from moso bamboo. Legs and frame are made of light aircraft grade 7075 aluminum. Carrying case and cargo net are made of polyester. ✔ CAN BE USED ANYWHERE – It is designed primarily for outdoor activities like backyard or bbq parties, camping trips, traveling, RVing,sunbathing at the beach or pool, excursions, etc. But it’s also useful indoors at home, at the office, or kitchen. Beckworth & Co. stands behind its products. So much so that we offer an unconditional "We Got You Covered" lifetime guarantee on all of Beckworth & Co. products. Contact customer support team for details or questions. What are you waiting for? Get your own SmartFlip Bamboo Portable Outdoor Picnic Folding Table Standard Deluxe Kit now!